A few weeks back, we showed you a photo of the National Confectioners Association (AKA “the candy lobby)’s booth at last year’s Academy of Nutrition and Dietetics Food and Nutrition Conference and Expo. It was the NCA’s first time at the Expo, and we sincerely hope it was also its last. Above is a photograph of one of the handouts provided at the NCA’s booth. While the reverse side showed “daily portions” of candy, this side illustrated “weekly servings”. 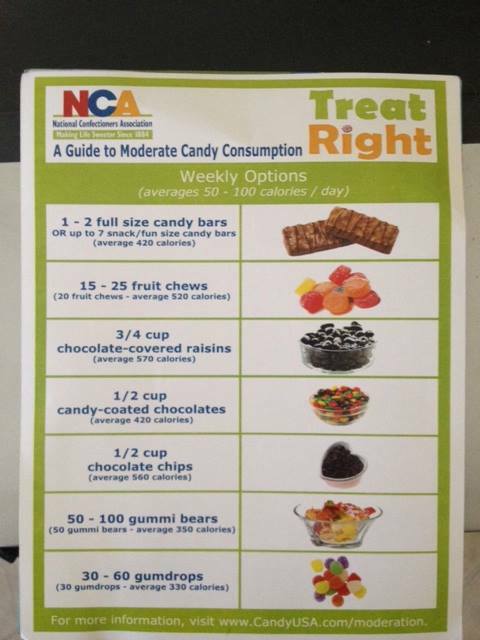 Per one of the NCA’s reps, this was so dietitians could tell their clients that it was completely fine to “save up” their candy servings and have the below amounts once a week. Among the suggestions of “moderate candy consumption”? A half cup of M&Ms, 50 – 100 gummy bears, and 30 – 60 gumdrops. This is the epitome of irresponsibility, and another example of why there need to be guidelines as to what information is available and handed out at the Academy’s conference and expo.